"Whoever wants to know the heart and mind of America had better learn baseball." This famous observation was made in 1954 by Jacques Barzun, a French-born scholar of American culture, and highlights the game's special connection to some inner cores of American civilization. But as Sayuri Guthrie-Shimizu, professor of history at Michigan State University, shows in her new book Transpacific Field of Dreams (University of North Carolina Press), baseball was a global game from its inception, and many around the globe, not the least of them Japanese, have claimed it as their own. Baseball has also linked the United States and Japan, even in times of strife, for over 150 years. Baseball was even played in Japanese American internment camps in the United States during the war. By the mid-twentieth century, the sport had become emblematic of Japan's modernization and of America's growing influence in the Pacific world. 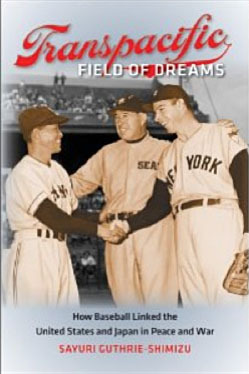 Baseball thus provides unique insight into U.S.-Japanese relations during times of war and peace, and, in fact, is central to understanding postwar reconciliation between the two countries. In telling this often surprising history, Transpacific Field of Dreams shines light on globalization's unlikely, and at times accidental, participants. In the book review, Barbara Keys, University of Melbourne says "Beautifully written and richly researched in English and Japanese-language sources, this book reveals that 'America's pastime' was truly a transnational game, one with power to bind two very disparate nations. This book will surely be the definitive study of an important topic with ramifications well beyond the world of sport."